In Windows 8 you can install lots of application and games from Windows App store. With this way you can enjoy lots of new apps on your Windows 8 PC. If in future you plan to reinstall Windows 8, so at that time you will lost all your Apps and games data like settings, levels, game Progress etc. It’s a very difficult task to locate the individual app data and manually back up its data. But now you can backup and restore all your Windows 8 App data with a free utility Windows 8 Apps Data Backup. Which allows you to takes the backup of whole data of apps and games from your Windows 8 PC, so you can restore them easily on your PC. It’s a free application for Windows 8 and Windows 8 Pro users that you can use to backup data from some or all applications to the local drive of your computer. All you have to download the app and install it on your Windows 8 PC and after the installation launch the app and you are ready to backup and restore Windows 8 App data with a one click. On the main screen of the app it has two option backup or restore. Click the backup button to take the backup of data from your PC. 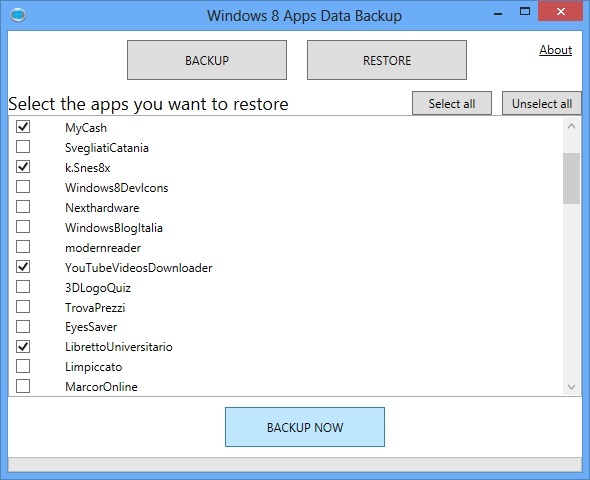 Clicking the backup button displays the list of installed Windows 8 apps, from here you can select the list of apps and games which you want to be backed up. Or you can Select all button to quickly mark all the apps in the list. Now hit the Backup Button and choose the local directory where you want to save the apps data backup in. The backup data will save in ZIP format to save space. If you want to restore the data on your Windows 8 PC, follow the same above process and click the Restore button and then select the source file that you saved on your local PC drive. Note: To restore the App data on your Windows 8 PC, first you have to install list of apps for which data was backed up. So double check you have already installed all the apps before attempting to restore their data. Windows 8 Apps Data Backup tool backups only Modern apps and data used these apps and not your desktop programs. The app works on both 32-bit and 64-bit editions of Windows 8. We tested this App on Windows 8 Pro 64 Bit edition and it works smoothly.